Until the big national electronics chains moved in, regional heavyweights like Highland and Fretter’s ruled the roost locally. 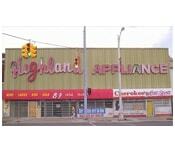 This is the original Highland Appliance store on Woodward. The chain has been out of business for several years, but the old sign remains.